– Indianapolis one-off entries that received no prize money are excluded from this list. – Dragon Racing consolidated its #6 and #7 entries beginning at Detroit and is therefore no longer eligible to earn non-Leader Circle bonus awards. 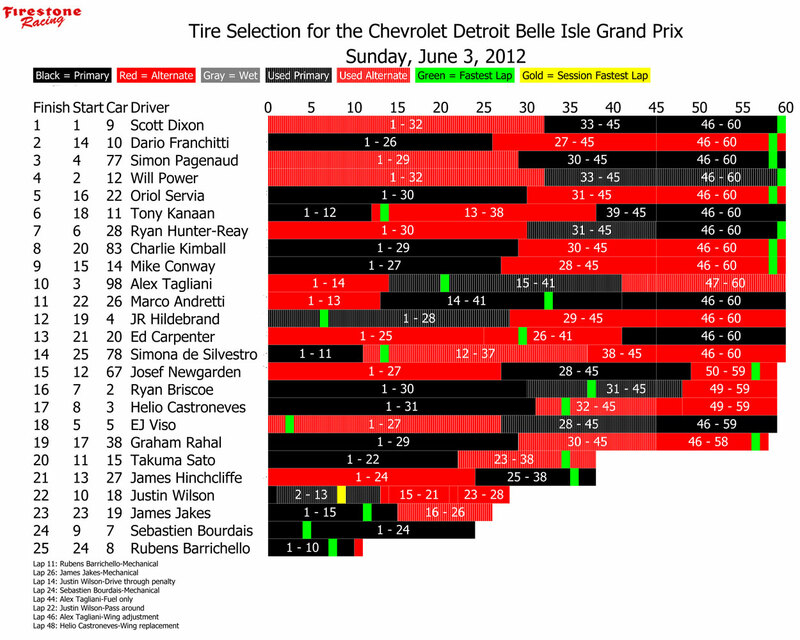 Rain:468, each entry has five sets available.From Firestone:The Firestone primary and alternate tire specifications for Detroit remain the same as those used earlier this season on street circuits at St. Petersburg, Long Beach and Brazil. The specs feature updated tread compounds for 2012 applied to the same Firehawk street-course tire construction used throughout 2011. For the first time, Firestone Racing has available this weekend its new rain tire specification, whose tread design is inspired by the Firestone Firehawk Wide Oval Indy 500 passenger-car tire. 38-Rahal and 78-de Silvestro will incur 10-spot grid penalties for unapproved engine changes made during the Month of May at Indianapolis. – 2-Briscoe spins in turn 14 early in session; red flag, no damage. – 22-Servia makes contact in turn 14; red flag, heavy damage to right front that should be repaired in time for qualifying. – 2-Briscoe and 28-Hunter-Reay make contact on pit lane; 28 held on pit lane for 60 second penalty. – 9-Dixon spins at turn 13 with ~45 mins remaining; red flag, no damage. – 78-de Silvestro stops on course in turn 13 with ~5 mins remaining; red flag, no damage. – Entire session run in moderate rain. – 18-Wilson makes contact with tire barrier in turn 7 with ~5 minutes remaining; minimal damage; red flag becomes checkered to end session early. One stop shopping, I LOVE IT!